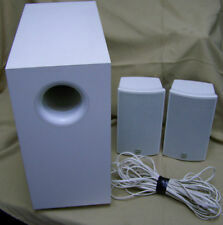 This center channel speaker that is pictured is what you will receive. Cabinet, grill and drivers are all flawless and in perfect condition. No issues whatsoever. Good used condition speakers with cosmetic flaws but flawless sound. Has scuffs and scratches. These speakers have a lot of bass for their size. One grill cover has patch from a tear. Please see pics in detail Tweeters have a little push in (cosmetic only and does not affect sound) These speakers have great reviews! See google reviews rated 4.9 out of 5 . Experience rich sound while enjoying music, movies, and more with the M25 Bookshelf Loudspeaker from Boston Acoustics. The M25's Lo-Q cabinet is built to reduce vibrations and eliminate unwanted resonances, and its compact size allows you to place the speaker on a bookshelf, wall shelf, table, or speaker stand. These are in great condition. They've been unused for a few years. A subwoofer needn't take up precious space in your viewing room. The VRiSub82 should be used with Boston's SA1 Subwoofer Power Amplifier. IN WALL SUB WOOFER. MFR # VRISUB82. Boston Acoustics VRiSUB82 owner's manual. But once in play, the VRiSub82 cannot be ignored. Designed for use with SA1 Subwoofer Power Amplifier. If you would like to know more about these subs just google "Boston Acoustics PRi85Sub manual " and the first search result will be the manual for the subs. Go through the manual for more information about the subs or installation instructions. MODEL NUMBER MARKED ON THIS ITEM IS: 006743. WHAT WAS TESTED ON or WITH THIS SPECIFIC ITEM: SubWoofer and speakers was connected to our PA system. WHAT WE FOUND: SubWoofer and speakers tested good, nice clean sound, no problems found. We cater to music enthusiasts and audiophiles, and we love what we do. We design audio systems for all budgets, from entry-level to high-end. Frequency Range (±3dB). Signature is required. We stand by our products. BOSTON ACOUSTICS BRAVO II CENTER SPEAKERS. 2 SPEAKERS. In Great Condition, used for a short time and then I kept them in climate-controlled storage for a long while. This pair of 2 speakers sounds great, simply going for a different sound! Condition - Tested in Working condition. See pictures for more details. What you see in the pictures is what you get. Type: Bookshelf Loudspeakers. ⦁ 2-way, reference bookshelf loudspeaker with system-specific, high-grade crossover networks. Connectivity: Wired. ⦁ Reference-quality Boston Sound™. Condition is Used. These are in good condition with normal wear. There ARE scuffs and minor blemishes on the speakers. THEY WORK PERFECTLY AND SOUND AMAZING. If you arent familiar with these do yourself a favor and research them. Item comes from a smoke free home and is in excellent working condition. If upon receipt you are not happy with purchase please contact me. Your satisfaction and hopefully earned positive feedback is what matters most to me. Also if if you feel there is an error in my listing please let me know while I consider myself fairly knowledgeable I am not an expert on everything and would welcome any suggestions. In very good condition. just one minor blemish on front as shown in last picture. 5 1/4" Woofer and 1" VR Tweeter. Excellent Sound and in Excellent Condition. BOSTON ACOUSTICS CR7 SPEAKER PAIR in. GRILL COVER LOOKS GREAT. Everything is tested and is in excellent working condition without any problems that I have noticed. I removed them to upgrade to a larger speaker and matching set. These speakers work fine and sounded good before the upgrade. I do not see a model number listed anywhere on them. We cater to music enthusiasts and audiophiles, and we love what we do. We design audio systems for all budgets, from entry-level to high-end. Signature is required. We stand by our products. Boston Acoustics CR57/Compatible Enclosure. Left/Right channel speaker system type. Model: 010-001933. Frequency Response 80 - 20000 Hz. 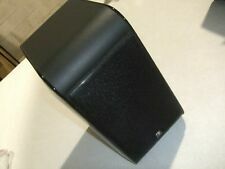 Boston Acoustics VR950 Tower Speakers Pair, Made in USA ! Very good condition ! sound great, Made in USA not " Malaysia " ! Bass Driver: 10" (254mm) Long throw OCCM woofer with 3" voice coil. AmplifierPower Class D, 500 watt RMS (1,800 watt peak). Frequency Range22 Hz – 150 Hz, -3dB.